I never had thought I would be taking a workshop in the big Apple, and I had been looking forward to this opportunity for months. 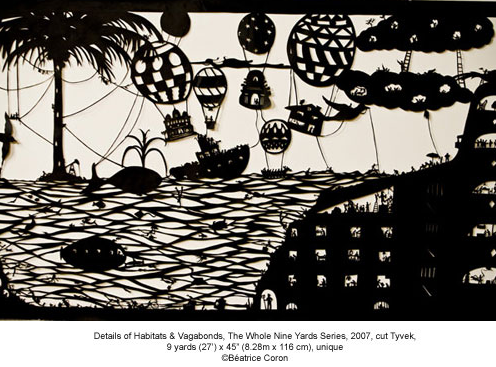 I had seen Beatrice Coron’s paper cut work in museums and galleries for a couple of years and I was very intrigued with her work. To my surprise she responded positively when I asked her if she would participate in a small show in a small town in North Carolina, and that is how she came to show two of her pieces in the Black and White show at Frank Gallery in Chapel Hill this spring. 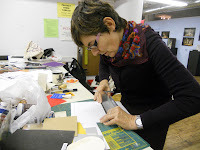 For those of you who are not familiar with her work, Beatrice cuts black Tyvek and makes incredibly detailed vignettes of all aspects of human life, mostly funny and whimsical but also more serious and above all her work is remarkable in its intense attention to detail. I asked her if she did any teaching and she mentioned the workshop the weekend before Thanksgiving at the Center for Book Art in New York. As I was going to be in the area anyway for the holiday I jumped on this and I got myself a reservation at something called Chelsea Lodge, a dungeon on 20th Street. I could see the feet of people walking by outside and at night I felt as if the metro trains went right under my bed, but the place was clean and roomy and the walk to the Center for Book Art was not too long. Beatrice Coron is an inspiring person, very adventurous, enterprising, flexible. 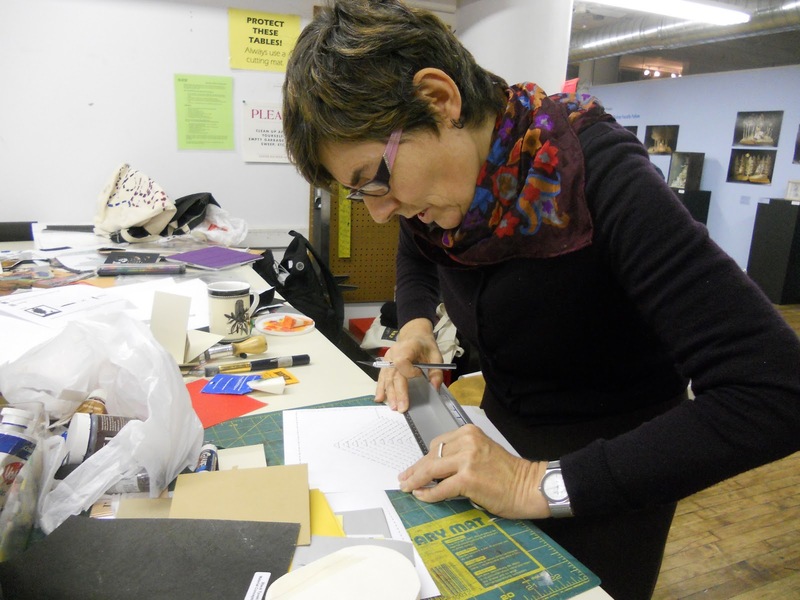 But what she does professionally is not really book art. She introduced us to materials I had never worked with before and her attitude of improvisation was great. I learned from how to cut, how to use that Xacto blade that I have had in my hand every day for years. There are lots of different kinds and I have tried several, but my problem is that I cut too far because if have the blade too parallel to the paper. I never knew this. If you cut more with the point you can stop and start more exactly. This is a great discovery. This is in fact the secret of her very very thin lines in the Tyvek, simple as it sounds it really isn’t. She showed us blades she learned to use in Japan, where you start the day in the studio sharpening the blade for at least 20 minutes and then you put the blade in the wooden handle and then you wrap many feet of thin twine around the handle to hold it together. Something for the meditative methodical mind. I am glad I don’t have to sharpen my blades! In any class you learn not just from the teacher but from the other students in the class and we were ten of us. Some were professional artists, one was a sociologist, one was a scientific writer. A great bunch of people, very inspired, very talented. 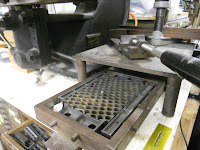 One was a young woman on scholarship to the Center for Book Arts and she is learning how to make books the way books was made in the middle ages. The place was full of lethal looking machines, heavy clonking things, huge knives and blades to cut through many pages and hard covers and the first thing we had to do as we entered the class room was to sign a waver promising not to sue the Center if we creamed ourselves on something. The machines were beautiful though and you get an appreciation for the enormity of the work that used to go into making books before mass production with glued pages and soft covers. We tried our hands at stenciling and at various 3-D books. I have made tunnel books for several years with varied success and Coron showed me a way to build them up section by section instead of cutting all the pates first and then fitting them in to the accordion sides. I am anxious to try this as it would be so much easier to go long and large with this technique. As a artist that also works with paper, I picked up some tips from this workshop that should let me have even more pleasure as I work with paper. I work with very thick white paper — to create a crisp sharp line and a play with light and shadows. 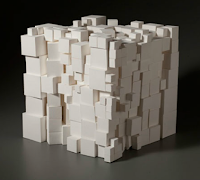 I work with holes and I like the way layers of paper create a feeling of great depth. I also use thin paper, news print mostly, which lends itself to layering, tearing, sanding, washing and shaping to colorful collages. And I also transform dryer lint into abstract landscapes or small framed garments. To see more of Anita’s work, see her website. To see the work of all Orange County Artist Guild members, so to the OCAG website. This such an interesting article about an art form of which I know virtually nothing. I like Anita's work as I have seen it in the past years. I think Swedish art education must be very different than in this country. I know another Swedish artist whose work equally reflects art as design or vice-versa rather than art as expression of ego. Not exactly a scientific sample. Just a comment. Mary Mendell has made a great observation about Swedish art education. I also appreciate good design and love the sculptural aspect of Anita's work. Thanks to Mary for taking the time to post her comment.